Since I already have a background in finance, from both my former education and work experience, I sometimes look forward to courses that can broaden my horizon a bit, like Leadership in Organizations or Business Strategy. 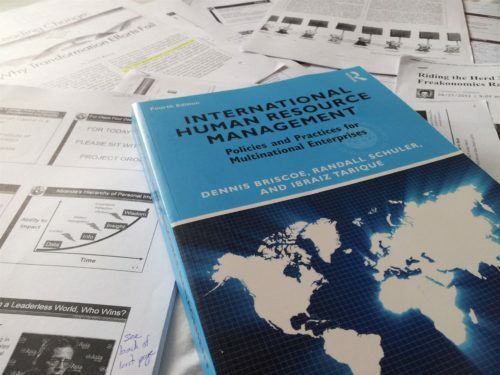 During this last hexamester we could pick our own courses, for the first time, so why not do a course managing HR in a global environment with professor Steven Miranda? If it doesn’t kill me it will only make me stronger. A rather dry book pointing out a lot of possible issues but offering no clear solutions. Unlike some professors Steven Miranda did not introduced his course by telling it would be boring or dry, but he did inform us the book we were supposed to read was. That makes me wonder why we did not get a different, less dry, book for this course, but who am I to question everything? Luckily the book was not as boring as expected, but it was irritating that the writers pointed out a lot of possible problems with managing human resources but lacked solutions or proposed action plans to tackle the problems. So now we are aware of the issues, but still have no idea what to do about it. The largest part of the course was focusing on HR in a global context, as the name of the course already hinted, meaning how to manage an international work force and expats. And this is where a lot of interesting things came up, mainly because my whole MBA here in Thailand can be seen as sort of an international assignment where I am in a strange country, working with the local people who speak a different language and have a different culture, hoping to make the best of the two years I am here and getting some assignments and presentations done to be able to graduate. The largest difference with a real expat though is that I have to pay for everything while an expat receives compensation from the company he is working for. Forming a group during this course is not easy, but it does force you out of your comfort zone. Unlike earlier courses we had a lot of exchange students joining us, and for the first time we were mixed with the Sasin MBA class of 2011 making this a very diverse group of people of whom I only knew a couple from earlier courses. And to make sure we would mix up enough we also got a group assignment, giving a presentation of 20 minutes during the last class, where there were some strict rules on how to compose a group to make sure we would not team up with the same people as always. Main learning point here was probably to let us work it out together with all the different nationalities and types of personalities: just as it would go in a company where you get assigned to a team instead of picking your old friends. 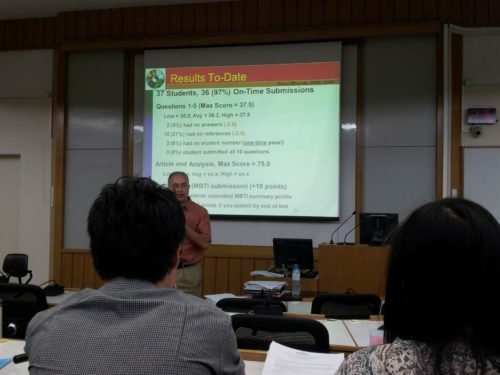 While we learned a great deal during the course, I have to say that the exam was a bit disappointing; maybe because the expectations were high after learning so much. Part of the exam was multiple choice, mainly asking about small details from the book, while the other part consisted of open questions we could work out on our laptops, in an open book exam format, with a maximum word count to make sure we would not write too much. During the midterm almost nobody finished within the three hours of allotted time, while the final exam was quite the opposite. What did stand out in a positive way was the speed with which we received our point scores of the exam and the quality of the explanations why we got that amount of points. Normally it takes between 4-12 weeks to get some feedback at Sasin, and often they only bother to send you your grade without further explanation. Here it took a couple of days to get feedback, even though the exam had open questions, something only seen before with the course Marketing 1 with professor Ian Fenwick. Some things that Sasin should consider for the upcoming years to make this MBA more interesting. 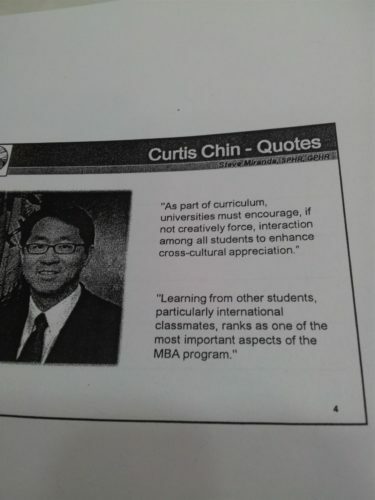 Near the end of the course we even had a guest speaker in the form of Curtis Chin, former US ambassador to the Asian Development Bank. One of the things that was pointed out was his stand on the role of the university to encourage, or creatively force, interaction among all students to enhance cross-cultural appreciation. This reminded me of a vote that was held under all students at the beginning of the year to see if for all the upcoming courses people should form their own groups or the group forming should be randomized. Back then about 5 people, mostly the foreigners, voted for randomization to be able to work with as many different people as possible while over 90% would rather team up with the people they already knew for the coming year. I wonder if this has changed after the first year for the class of 2012, but I guess I know the answer already (something to do with comfort zone). 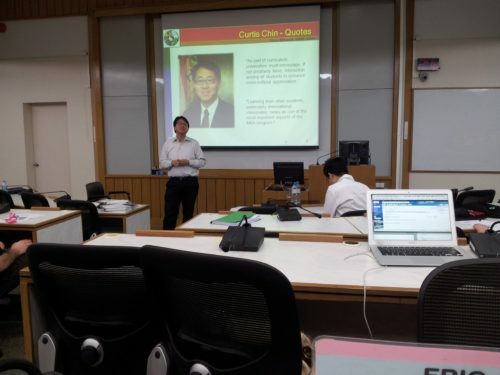 Curtis Chin as a guest lecturer at Sasin; he offered so many insights that I cannot repeat them all here. Totally against my expectations this course turned out to be one of the most interesting courses I have done so far this year, and I really got the feeling I learned some valuable lessons that I will apply during the rest of my life. It also opened my eyes to what I should aim to get out of my 2 years here in Bangkok and how to approach it, something that gives me clear direction on what to work on. This course is highly recommended for the upcoming class of 2013, even though it might mean you have to speak up in class (scary) and work together with foreigners (scary) on a group assignment.